In the Future, We Are Dead by Eva Müller is a collection of nine short comics thematically linked in their exploration of mortality. Some stories focusing on a young Müller coming to terms with her growing terror of death, others show a grown Müller still grappling with her fears. Most interestingly, a handful of the stories are narrated by surrogates for Müller, be it what seems an older version of herself or her estranged brother. 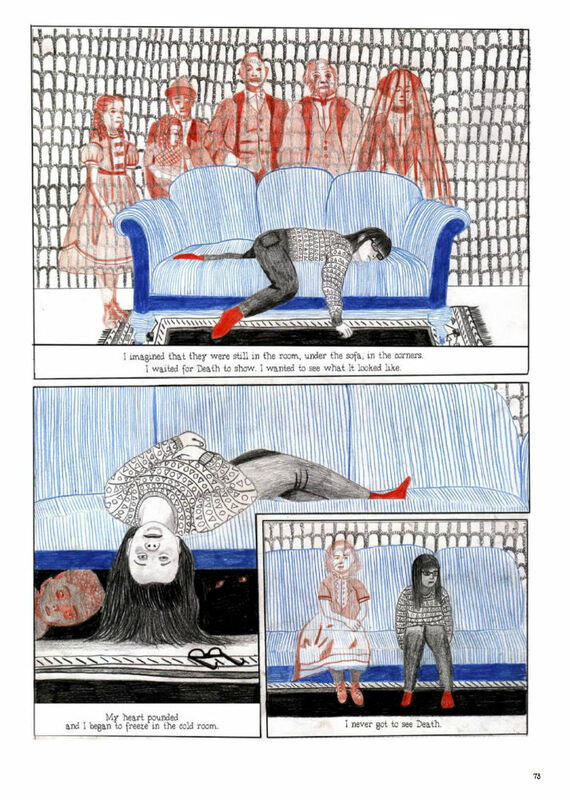 Autobiographical specificity is not the most important element of what Müller is focusing on here which allows to her to deal more with the emotions connected to what is being experienced than the particulars. An artistic choice reflected not only in the narrative construction, but in the visual storytelling as well. In collecting these smaller meditations on death Müller is able to create a more thorough examination of the way in which the knowledge of our own mortality influences our life. As a child she is, as are many children when the first become aware of death, terrified that it may come at any minute. In becoming aware of famine and crippling illness she is left sleepless and cowering in fear that it may one day visit her. As she grows, death’s abstract terror is replaced by the equally uncertain fear of what happens after we die. Growing up heavily Catholic she acquires all the customary purgatorial fears for having committed minor sins. Her fascination with death is further amplified by her grandparent scrapbooking of obituaries and consistent attendance at local funerals. 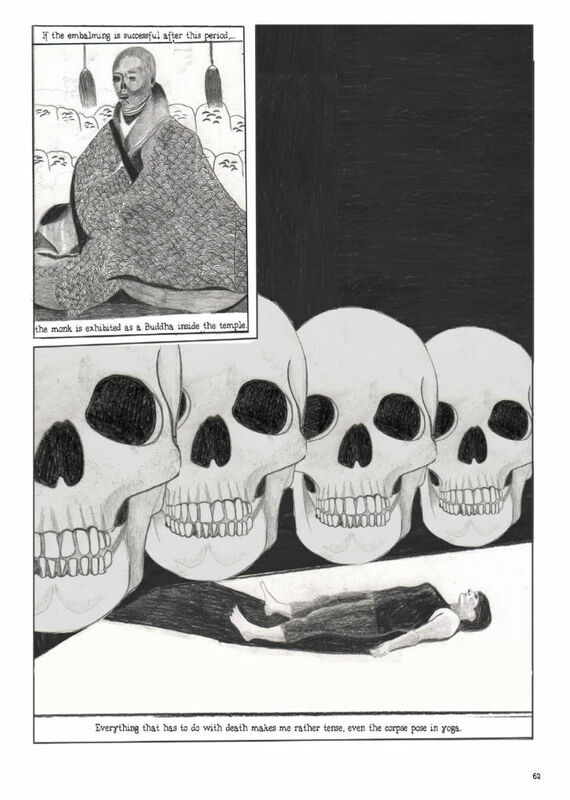 In the grandparents’ house Müller spends hours in the “fancy parlor,” where the bodies of many members of her family had been laid out before being buried, imagining herself surrounded by the ghost of her late ancestors. Within the cold “fancy parlor” her heart races at the though of encountering death, this is later mirrored when she stands on the flimsy floorboards in the attic waiting for a break and a plummet into darkness. She later recognizes this attraction to death that runs in her family as a form of “angstlust”; a desire for the excitement created when one faces their own destruction and survives. Reaching adulthood, death is no longer the unexpected terror in the night and is thus robbed of the thrill of confronting it. 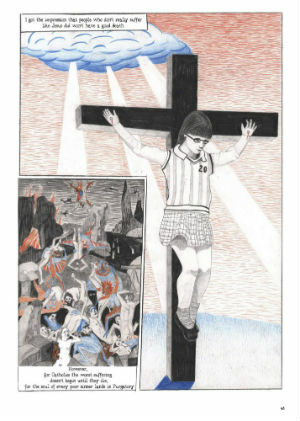 In the stories featuring the adult version of Müller we see treat death as an accepted ever present ugliness, but one she would rather not dwell on. 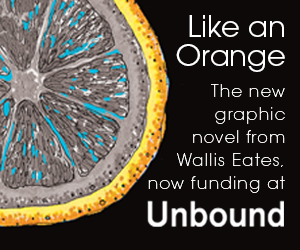 In one story she avoids contact with a ninety-seven-year-old woman she had previously become friends with. The old woman’s monumental thimble collection, one that will end up in the dumpster following her death, perhaps too much of a reminder of the folly of seeking comfort in the permanence of objects. She gives up on yoga rather than deal with the visions of mummified Buddhists and her own slow decomposition brought on by the session ending “corpse pose”. What seems to be Müller imagining herself as an old woman reflects back on her punk rock young adulthood and a life lived unafraid of mortality being brought to a halt by the death of four of her teeth. Lastly, Müller’s brother narrates another version of that young adulthood to the reader. Here we see the sturm und drang of Müller’s dysfunctional family and the opposite life paths the two siblings take to escape it until brother and sister are finally reunited at their father’s funeral. The broken family, much like death, can only be pushed aside for so long until we must come to some form of reckoning with it. This is not to say that the proceedings are all doom and gloom. 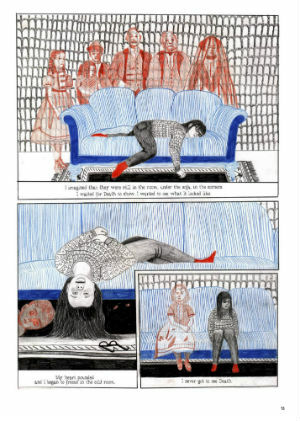 Müller is distinctly aware of what she is doing and frequently uses her visual storytelling to contrast grim subject matter with tragi-comic visuals. 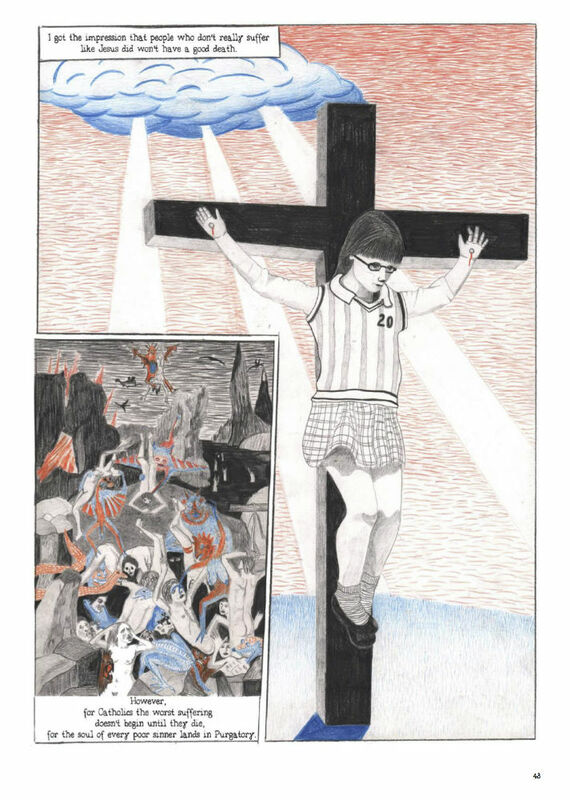 With a combination of ink and colored pencil Müller uses her European soft photo-realistic style to render her childhood-self blasély crucified and passively subjected to the Bosch-esque torments of hell. Knowingly shaking the hand of the devil for such sins as giving the cat some of Papa’s beer her face is resigned as the demons drag her away to be cooked in a pot. Where she juxtaposes yoga poses with the animals they are named after, it feels like a subtler, less sweaty form of a joke from a Lisa Hanawalt comic. Proper ghosts loom over her as she slumps down on a couch in the “fancy parlor.” Her brother’s straight-laced life shown side by side with the sneers and rolled eyes of her found family of punk rockers, close ups of sharing an ice cream cone with a dog, reproductions of naïve Romanian tomb paintings. 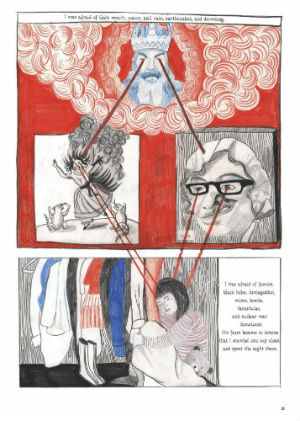 All of these are meant to eat away at any notion that we the reader are supposed to come away from Müller’s comics with a sense of fatalism. In the final story of this collection we see her no longer sparring with death, but instead waltzing with it in a close embrace. This image feels central to the entire collection in that we are forever locked together with death, but it need not be in combat. It can be in earnest, in acceptance; perhaps we can even learn to laugh at it. Of all the coping mechanisms presented in In the Future, We Are Dead, this seems to be the best one. 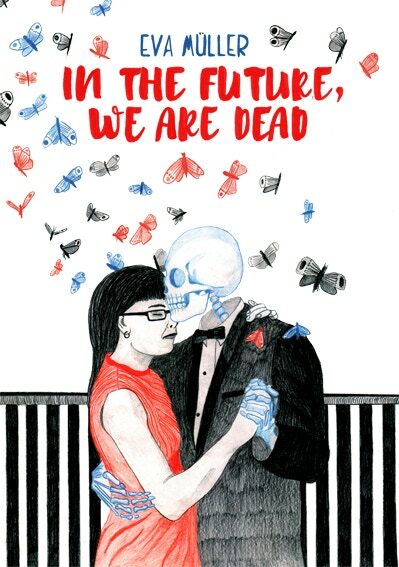 In the Future, We Are Dead is a strong North American debut for Müller as it showcases her artistic abilities and the breadth of her storytelling. 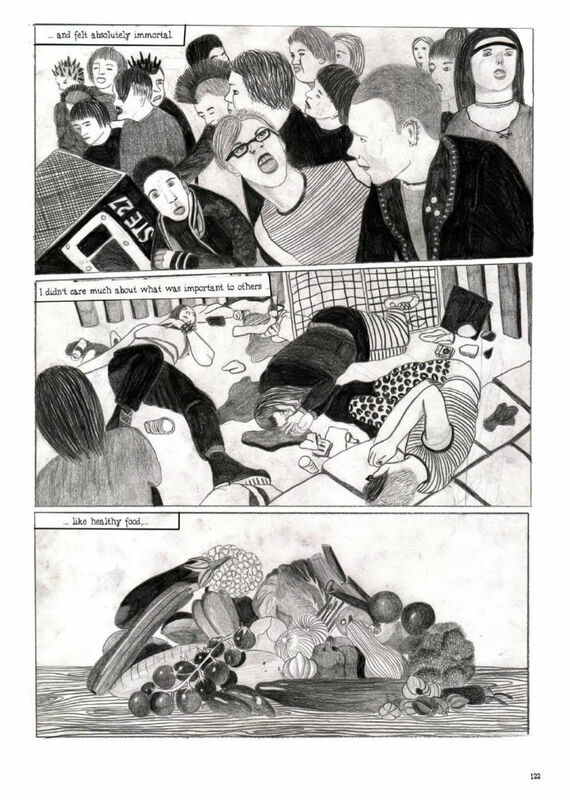 The work is distinctly European in its visual style while deeply sardonic in tone. That there is a certain level of obfuscation as to the exact autobiographical nature of the events depicted actually plays in Müller’s favor as her characters are deeply human and relatable whether they are real or not. Like the best autobiographical work, we leave In the Future, We Are Dead feeling as if we know Müller and that we have become friends with her. In a world where death is ever-present and inescapable it’s reassuring to have someone with Müller’s perspective to face it with.